In 2015, more businesses were awakened to the reality that they are not immune from the Dark Side of the Force: cybersecurity breaches, litigation, and financial costs. 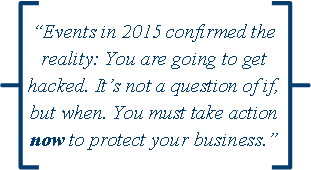 Events this year confirmed the reality: You are going to get hacked. It's not a question of if, but when. You must take action now to protect your business. We can help – call or email us today. 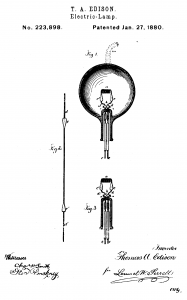 See below in this letter for a way to get our 2016 Patents Calendar. As you consult the calendar, keep in mind that next year, directors and officers will be held to stringent standards of care in protecting data about their customers and employees, as well as their own business secrets. Businesses that don't take action are already being held accountable by courts, insurers, customers, and their own shareholders, and are losing money, opportunity, and their reputations. 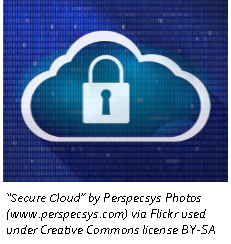 On February 2, 2016, Gerry Elman will be presenting at a webinar on Cybersecurity Litigation. We have a limited number of free and discounted passes to share with our friends who'd like to attend. Please click here for further information. Patents are still proliferating, even as the legal landscape for protecting technology is rapidly transforming. We focus on the future and have adopted best practices under current law. While a portfolio of patents can typically be valuable, some of our clients are surprised when we occasionally suggest a strategy for trade secret protection that may be a better fit. Our clients' innovative ideas continue to impress us, and we enjoy seeing an idea grow into a successful business. We've never lost the excitement of being able to buy their inventions at local and national stores, knowing that we contributed to their success. Thank you to all of our clients, including our newer clients and those who have been with us for decades. Once again, we take the opportunity to wish you a happy and prosperous New Year. Thanks also to all who have referred prospective clients—we hope you've enjoyed the artisan-roasted Swarthmore Sunrise coffee produced by some of Gerry's neighbors. We appreciate your keeping our skills in mind and endorsing us to each of your colleagues who might benefit from what we do. To help you mark the coming days, we are pleased to offer a special calendar which we hope you will enjoy. 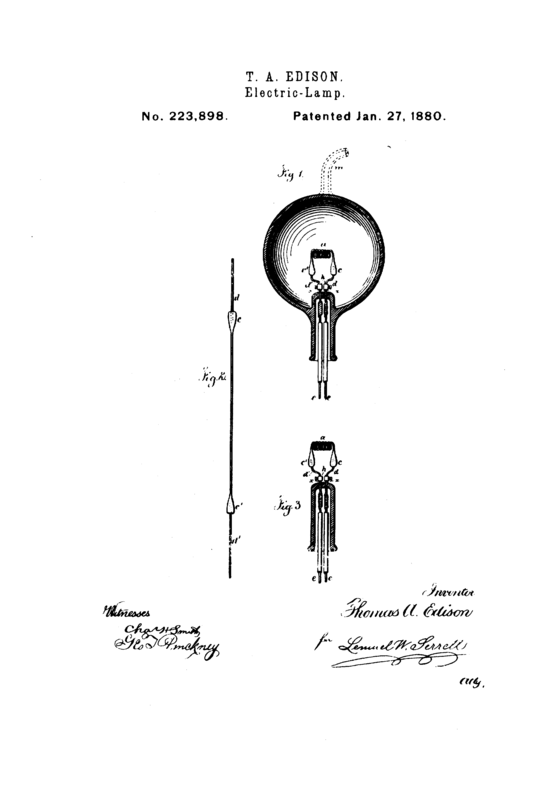 Each month highlights a particular invention, and it shows the dates on which interesting United States patents were issued. Please complete the form below to provide or update your contact information. You'll then receive a link by email, which you can use to download a digital copy of the monthly calendar in PDF format.